This is what I've been working on in my spare time. After two years of making games for school (both high-level "game design" scripting and low-level C++ engine programming), I decided to, as an experiment, just really try and nail an aesthetic. 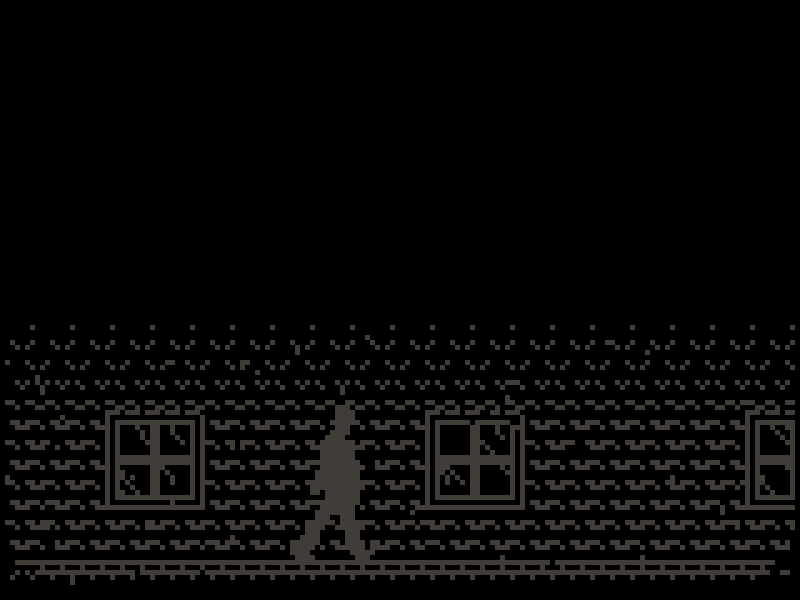 I was helping a friend make a thing in Game Maker and I drew all the example sprites using only black and white pixels. 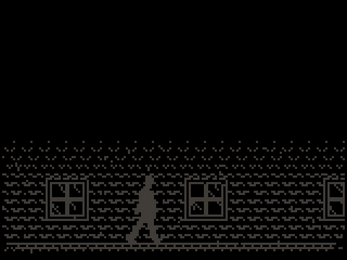 The look really stuck with me, and thus Rain Game, a game with only three (for now) colors was born. 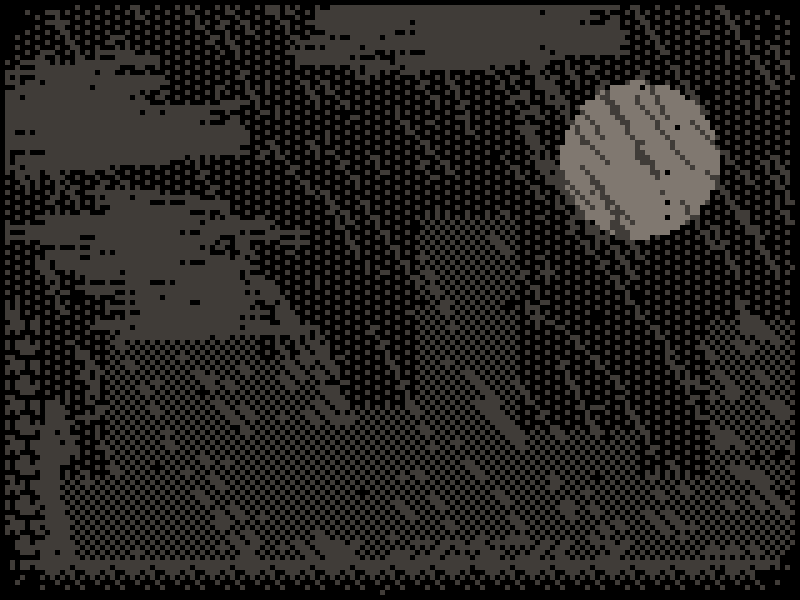 Rain Game is, right now, a brief mood piece where you can interact with three objects (two of which are the same! 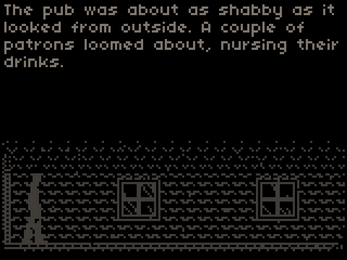 ), and go from the "outside the bar" area to the "inside of the bar" area (but not the other way around!). I have no idea what is going on with the story. I just wrote a few Max Payne-sounding lines to fit the mood, and that's about it. Despite this, I really, really like what I have so far, and will definitely keep hacking away at it over time. 160x120 resolution. No "the graphics are rendered at a low resolution but we want to draw a lot of text so we have higher-res fonts on top of lower-res graphics" crap. Limited color palette. Right now, only three colors are used: black, dark gray, and light gray. Rain Game features a color palette system, though, and these colors can be changed dynamically at any time. No alpha blending or transparency effects. 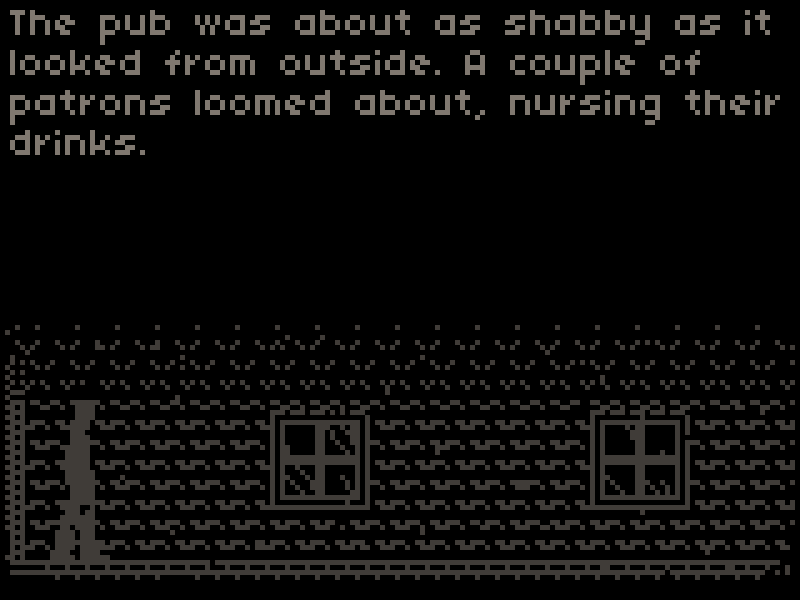 Any time "transparency' is needed, dithering will be used instead (see: the fading at the start of the game and when you enter the bar). 60 frames per second "gameplay", despite the film-esque aesthetic. (Some things such as "film grain" are "slowed down" to make it "feel" "film-like" without sacrificing the 60FPS animation. Combat will not be the focus of the game. Rain Game is made in Game Maker for now, but I might port the whole thing over to Unity or something, now that I'm actually learning how to use Unity. (Unity is okay.) 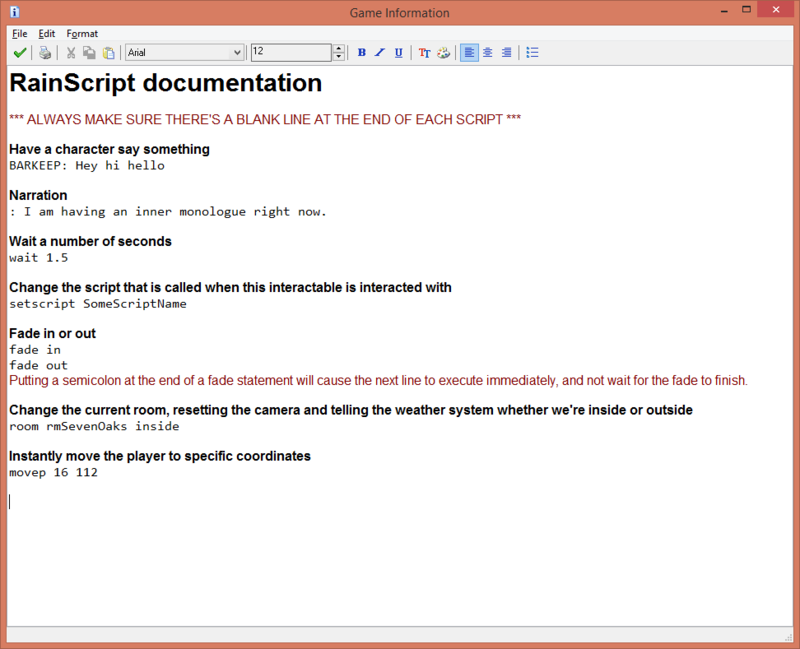 The main reason to do this is I want Rain Game to be a game with a lot of dialogue and stuff, and, right now, this is what it looks like to write "scripted events" for Rain Game. Gross! I might be collaborating with someone in the future when it comes to writing, because I'm bad at it, and I want a more robust scripting system than what Game Maker will allow me to create. 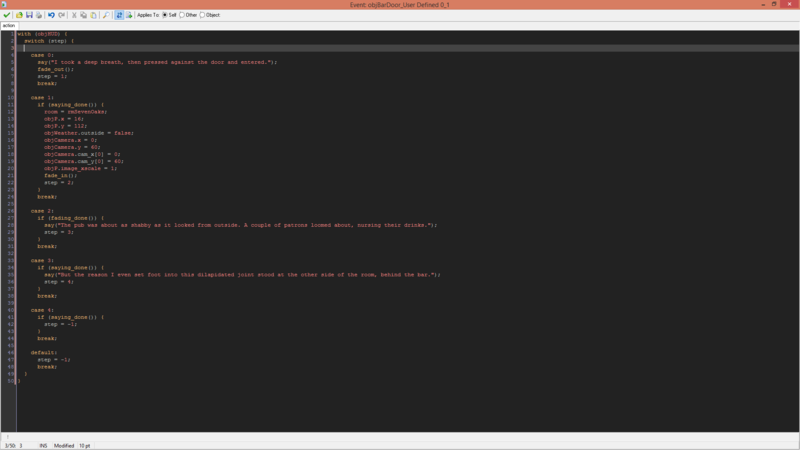 UPDATE: I've now made my own scripting language parser thing in Game Maker (obviously called RainScript), so scripting now looks like this instead. Pretty cool! Still don't know where this game should go, though.